Researchers from the School of Chemistry and Chemical Engineering, Queen's University and colleagues from the University of Liverpool, and other international partners, has created a new fluid and found that the liquid can dissolve gas in unusually large amounts. The gas will be absorbed into the 'hole' in the liquid. Their results are published in the journal Nature. This three-year research project could pave the way for more efficient chemical processes and environmentally friendly. One was a procedure known as carbon capture, ie trapping carbon dioxide from major sources, for example from fossil fuel power plants and storing the carbon to be prevented of entering into the atmosphere. 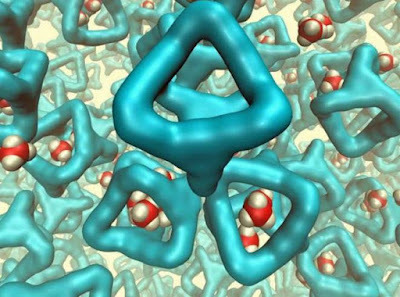 Professor Stuart James of Queen's School of Chemistry and Chemical Engineering said, "The material contains a permanent hole or pore is an important technology. They are used to manufacture a variety of products from plastic bottles to gasoline. However, to date, the porous materials has solid. What we do is design a special liquid from the bottom up." "We design the shape of the molecules that make up the liquid, so that liquid can not fill all the space. Because the holes are empty, we then form the liquid from the inside, and found that the fluid it is capable of dissolving the amount of gas that is unusually large. This is the first trial is needed to understand the types of materials, and the results showed an interesting long-term application of smelting gas ".